The Columbia College Alumni Association oversaw a comprehensive alumni data verification project from October 2015 through May 2016. To manage the time and efforts that a project of this magnitude required, we enlisted the assistance of Publishing Concepts, Inc., (PCI) in Dallas, Texas. Postcards, phone calls and emails were sent to all alumni from PCI regarding this project on our behalf. The data verification process closed on May 3, 2016. The information we have on file and new alumni updates were used in assembling the Columbia College Alumni Directory, a book that is available for purchase in a printed and/or digital format. We greatly appreciate you taking the time to verify your information. The directory is a valuable resource for us to communicate with you, as well as an easy way for you to stay connected with fellow alumni. All proceeds from directory orders benefit the CCAA Scholars Program. Print and USB drive alumni directory pre-orders were delivered in December 2016. 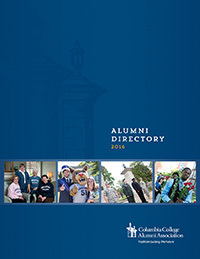 Additional directories are only available for purchase by Columbia College alumni. If you have questions regarding your order, please contact the Office of Alumni Relations. Thank you for your support of the CCAA!